The Advancing Care Information (ACI) Performance Category is Meaningful Use updated to be more flexible, customizable, flexible and focused on patient engagement and interoperability. 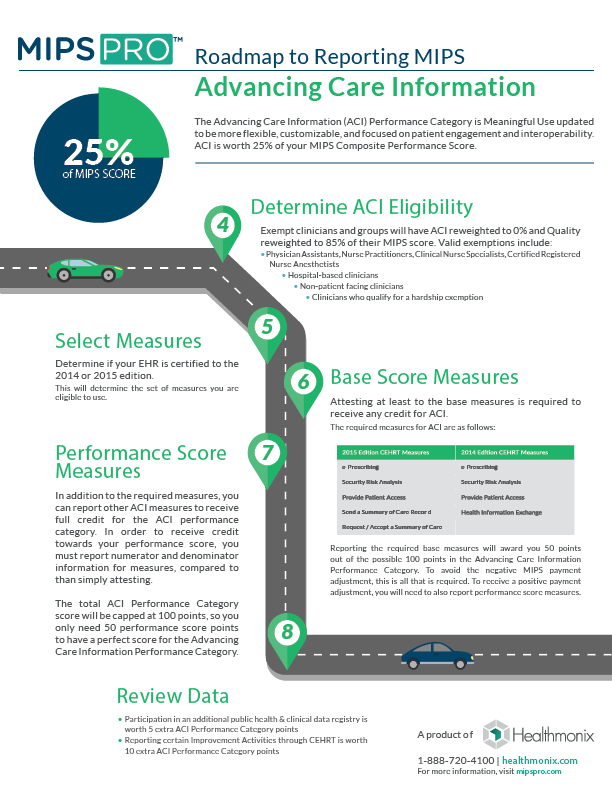 ACI is worth 25% of your MIPS Composite Performance Score. The Advancing Care Information Performance Category will be replacing the EHR Incentive Program (colloquially known as Meaningful Use) for 2017 performance year, as a part of the Merit-Based Incentive Payment System (MIPS). One of three performance categories to be scored for 2017 reporting, ACI will be worth 25% of your total MIPS Composite Performance Score. 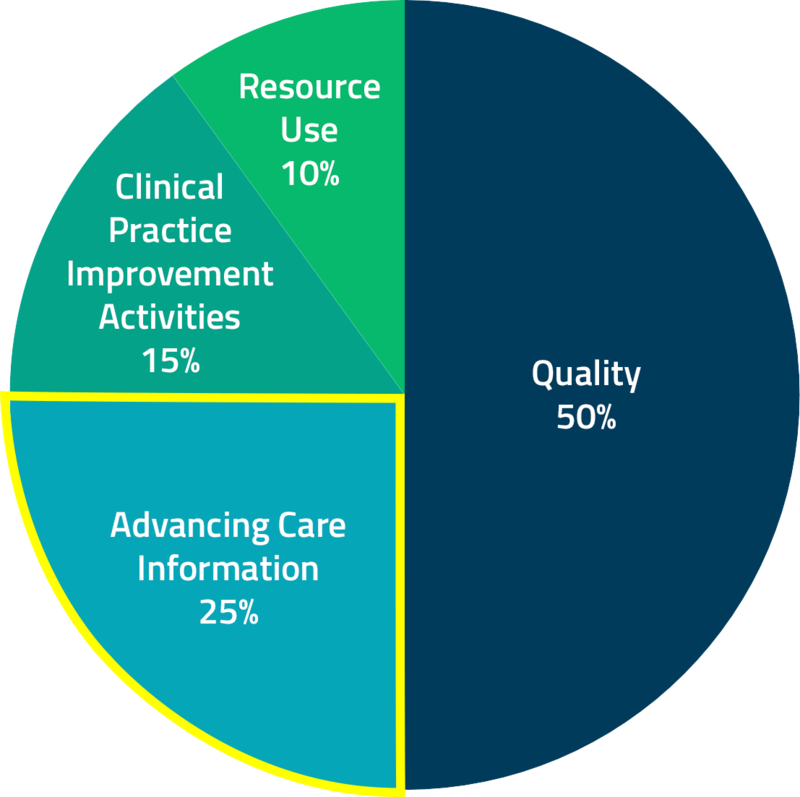 Non-physician eligible clinicians, hospital-based eligible clinicians, and non-patient facing eligible clinicians are considered ineligible for Advancing Care Information, and will have this performance category automatically re-weighted to zero. Last week, we discussed what clinicians are eligible for MIPS, the base score for Advancing Care Information (ACI), and what the performance period is for ACI. This is part two of our "5 Key Facts You Need to Know for Advancing Care Information" series. Per the blog post last week, the proposed rule for MACRA's MIPS, effective January 1, 2017, the Meaningful Use electronic health records (EHR) incentive program will be folded into the Merit-Based Incentive Payment System (MIPS) for Eligible Providers. The successor to Meaningful Use, known as Advancing Care Information, includes fewer measures than the current program, intends to provide more flexibility in meeting those criteria, and stresses the use of technology to improve patient care. Per the MACRA Quality Payment Final Rule, effective January 1, 2017, the Electronic Health Records (EHR) Incentive Program (Meaningful Use) will be folded into the Merit-Based Incentive Payment System (MIPS) for Eligible Providers. The successor to Meaningful Use, known as Advancing Care Information, includes fewer measures than the current program (yeah! ), intends to provide more flexibility in meeting those criteria, and stresses the use of technology to improve patient care. To help you maximize your performance in this category, we have compiled the top five things you need to know now to prepare for next year.